Adama. 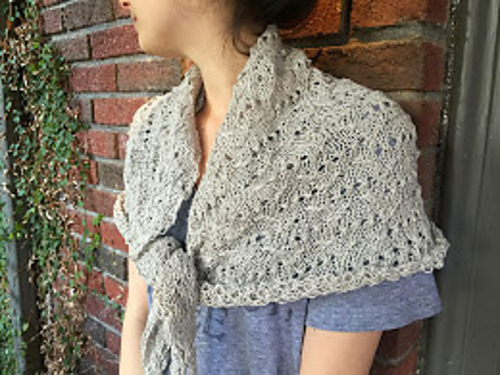 I absolutely adore this cowl pattern. It's been on my "knit it now" list for quite a while. 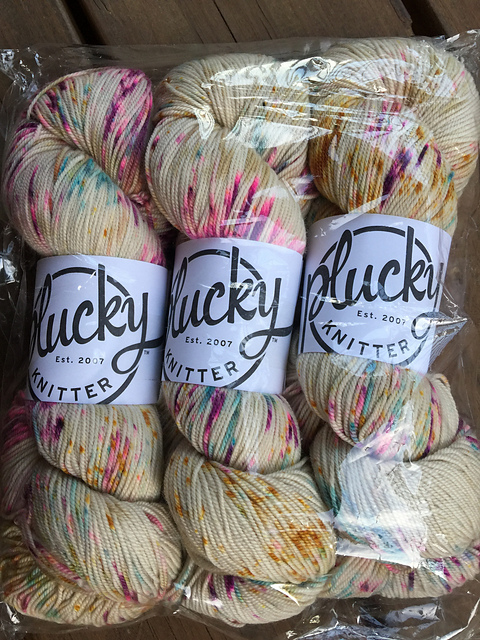 I cast on last week, after running into my Local Yarn Store (It's called In The Making. It's a good enough shop that if you're coming anywhere even close to Birmingham, Alabama, you should detour for a visit) to pick up a few things. The pattern is well-written and has a clever design. But, you're going to have to listen to me whine about it in this post. Please keep in mind that the whines are all self-inflicted wounds. The pattern is lovely and I expect to end up with a charming finished object, if I can just get my act together. Adama is written for The Plucky Knitters' Scholar, a worsted weight cashmere and merino blend that relaxes after blocking into a smooth, light-weight fabric. And I had some gorgeous Scholar set aside for this pattern. But, when I visited my LYS, one of my favorite knitters there was wearing a gorgeous version of Adama, knit in Woolfolk's Får. Får is a very different yarn from Scholar. Scholar is a woolen spun yarn, which makes it light and fluffy -- it's a web of cashmere with a little merino for balance. Får is a chainette construction, it looks a bit like a 3D crochet chain, and no matter how hard you pull on it, you would be unable to break it, which is something you can do quite easily with a woolen spun yarn. Får is dense and furry. 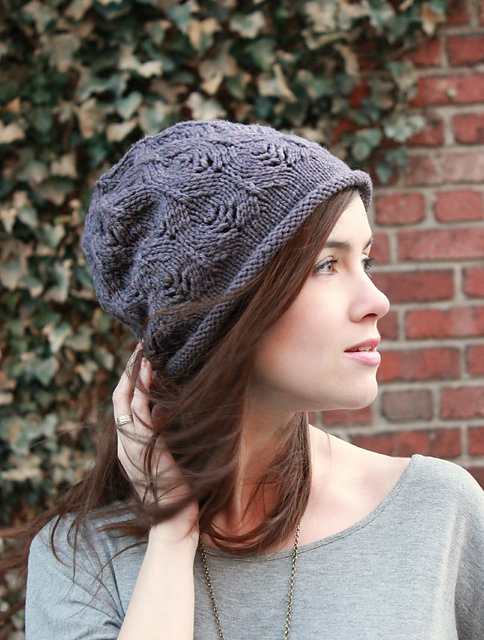 It's wonderfully soft and has a pretty halo you don't normally see on a 100% merino yarn. All of that to say, it's rather a denser knit than the lacey Adama calls for, at least in its in-progress, pre-blocking version. It took awhile before I could discern the emerging pattern. This yarn is absolutely horrible to have to rip out. But that shouldn't be a problem, right? I am, after all, an experienced knitter and this is a simple pattern. I'm blaming this one on the cough syrup I've been taking at night, but I have ripped rows out of this project, again, and again. Probably more than everything I knit last year, combined. This is an easy pattern, and something I would have expected to complete in three or four evenings of knitting. But, the version I saw alternated sections in two different colors and I was so taken with it, I decided to imitate that approach, which is not part of the pattern. On my first try, the row that that looked like the right place to break in the pattern was too late. Rip. Second time around, I forgot to switch colors when I got to the proper row. Rip. And amazingly, I've forgotten to switch every time I've gotten to a color change, even though I stuck a big purple annotation marker in all of the right places on the pattern. Definitely the cough syrup. It's not easy to rip out several rows of knitting in Får. That is particularly true of the lace rows I've been ripping out. Even worse, I've been knitting mostly late at night, when the light is poor for a project so dark -- the darker of the two greens is very close to black. So I've been struggling to see the PSSO's and SSKs and get them back on the needle properly, in poor light. To compound my problem, my other size 7 needles are in use, so I'm using a not pointy, not for knitting lace, pair of Addis, that although a fabulous needle for normal knitting and doable for this project, are horrible for trying to pick apart and unknit stitches. Like I said, all self-inflicted wounds. The moral of the project should be, if you're going to use a yarn that isn't quite what the project intended, get yourself the right needles and some decent lighting. But I'm going to slug this one out because I really want to finish this project. I'm on the fifth color change out and guess what? Missed it again. I'm midway through the rip back -- I gave up late last night and I'm going to pull it out in the light of day to make it easier. Why am I doing this? The cowl I saw in the shop was so beautiful. It was warm and fuzzy. The colors were elegant. The shape was perfect for a cowl -- close fitting for warmth but a striking accessory. 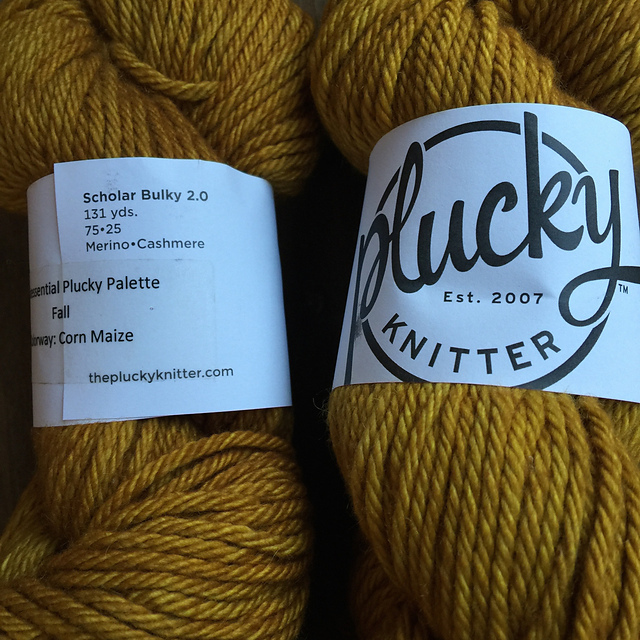 I'm usually a process knitter who enjoys the journey, but here, I'm pure project knitter. I want the finished object! So cross your fingers for me. Hopefully, I won't rip out too much hair while I rip out my stitches and I'll remember the rest of the color changes. And if you're on the edge about knitting Adama, do. I'm sorry I waited this long and suspect this won't be the only time I knit it. I'm going to need a hat to wear on my travels this spring. I want something lighter weight than the hats I have managed to keep out of my children's greedy little hands and also a springy green color. Since I didn't seem to have anything the fit the bill in stash, I dyed this. They are both tempting choices and I feel sure I'll end up knitting both of them. The yarn itself seems to almost completely lack a Ravelry presence, so I'm knitting blind here. But I tend to like Kraemer's yarns and this one dyed up beautifully, so I have high hopes. A note about the dyeing process. I like to apply color to yarn in layers, rather than all at once, to get more organic color variation in yarns that aren't going to be level-dyed a solid color. 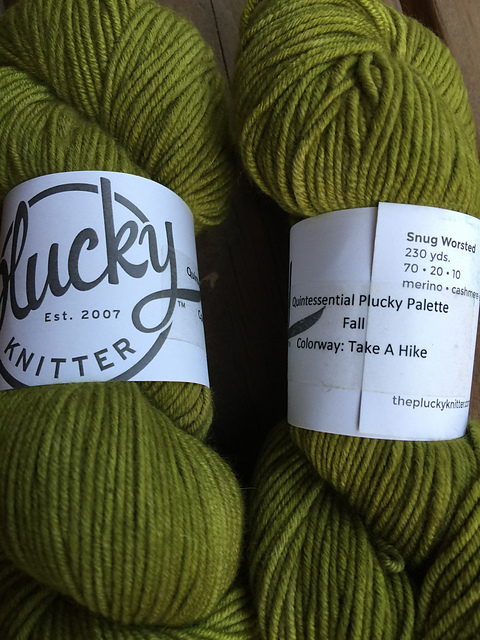 This yarn was originally dyed a pale yellow and then overdyed with a blue that was a dilute almost-navy solution, before being glazed in a yellow-brown. Although I'm often asked is glazing is worth all the work, there is no doubt in my mind that the same principles I used to use in painting collage backgrounds are equally at work in dyeing yarn, and there is simply no substitute for carefully applied layers of dye, each of which makes the final color full and rich. I'm having one of those "cast on all the things" weeks. I like weeks like this -- sad about the demise of my Flyaway Hoodie (at least until I figure out the proper size and needle size and cast back on), I decided to start several smaller projects so I would have some instant gratification and knitting always ready and at the go. (3) Wilde. I like this cowl. It has (subtle) stripes. I don't know how to knit stripes -- I always get that funny uneven jog when knitting in the round. So this time I'm going to buckle down and figure out the jogless stripe trick that every other knitter in the world already knows.